When the preview for the March issue came out I saw this photo and I fell in love with her entire outfit. I thought the colors and the lace combo looked fantastic, and I wanted to make the whole thing. I started by making the skirt, figuring it was the easier piece of the two. Then I got really really busy and didn’t get around to making the top part until now. The sad thing is that the cardigan really didn’t take me as long as I thought it would, so I really should have just thrown it together earlier this year anyway. I’ve been wanting to make this since February. This doesn’t really count as part of my summer sewing binge – it is definitely a spring piece – but I have had the pattern traced since the beginning of March, and the fabric has been sitting in my upcoming projects bin nearly that long. (Yes, I have a box dedicated to fabric that I plan to use on quickly upcoming projects – I try to pull out all the fabric I want to use for my next 2-5 projects and store it right next to my cutting area for easy access, which makes it much easier to move on to the next project, since everything is at hand.) So I decided I might as well go ahead and make it rather than put it off and have the pattern sit around for several more months. Here is my version, styled to be similar to the model photo. Though Burda seems to think this should be worn over nothing more than a bra. Ummm, no. Sorry internet, not today! Slightly better photo of the top, but my head got cut off. Back of the sweater top. I really like my button snaps. I had to use a hammer to put them on, but worth it I think! Pattern Description: Cardigan with gathered front. Pattern Sizing: Burda sizes 34-42. Based on other pattern reviews, I decided to go up one size from what I normally trace. This was excellent advice! I used a size 40 on the back neck, and a size 42 everywhere else. Normally I use a size 36/38 on the back, and a size 40 elsewhere. However, this is a very close fitting pattern, so it is probably best to go up one size larger than normal. Were the instructions easy to follow? Yes! It was odd, really. I thought I would set the sleeves in flat and ignore Burda’s instructions, but after fiddling with things I actually found that it would be easier to set them in the round, so I actually followed Burda’s instructions exactly, and there wasn’t a moment of confusion. Not that I needed them, but I always read through them for kicks. But these were actually good. I was sort of shocked, actually. Did it look like the photo/drawing when you were done with it? Yes! Almost exactly, actually. I intentionally picked fabric that would be as close as possible to the garment in the Burda magazine because I really loved the style and color. What did you particularly like/dislike about this pattern? Likes: The style with the gathering is really pretty, and the drafting on the sleeves is excellent (they were very easy to set in). The instructions were also good, and I think the style is flattering for me, so I really like it. It was also nice to have a more fitted pattern, since it seems like most of the cardigan patterns lately are very loose and oversized. Dislikes: I found it a bit fiddly to attach the collar band, though I expect that was mostly due to my fabric choice of a rather delicate lace. Fabric used: I used a stretch lace that I got from a sale on fabric.com. The lace had a fair amount of stretch in one direction (horizontal) but almost no stretch in the other direction. 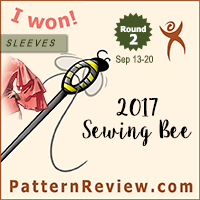 It was very lightweight and sort of fiddly to work with, though it went through my sewing machine and serger much better than I anticipated. Pattern alterations or design changes you made: I used snaps as closures instead of buttons, because I thought they would put less stress on the lace fabric. Would you sew this again? Would you recommend it to others? Yes and yes! I would love to make this again in a heavier fabric. I will have to find a knit with a good amount of stretch since this is a bit more fitted, but I would like a version I can wear during the fall/winter when it gets colder. 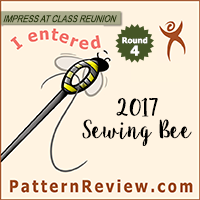 I would recommend this to others – it is a flattering pattern and very quick to make, with good instructions – but I join in with other reviewers in cautioning that you should go up one size when you trace. Conclusion: Love this pattern! It is a great style, and goes together fairly quickly. I expect to be making more of them in the future when the perfect fabric comes along. As of now I still have two patterns that I traced much earlier this year sitting around waiting to be made. Though they are both definitely spring sewing and not fall sewing. So I am debating – should I go ahead and make them, even though I won’t be wearing them for a while? Or should I put it off until closer to next spring? I am feeling the pull of fall fabrics and I am tempted to head in that direction, but I also feel that I might as well make these since I have everything nearly ready to go. And, well, who knows? By next spring I might be excited by completely different projects, so I might as well make these now, right? I mean, they aren’t really UFOs, since I haven’t cut anything, but I also don’t like having unfinished projects hanging about. So… more unseasonal sewing? Or is it time to get with the times? Super cute cardy. Love the style and color on you. I really like the combination of the cardigan and skirt together – like they were made to be 😀 The colors are very spring but refreshing. I think the fit is great too. I understand about the unfinished project box. It stares at me from the corner when I'm tempted to make a new pattern instead! 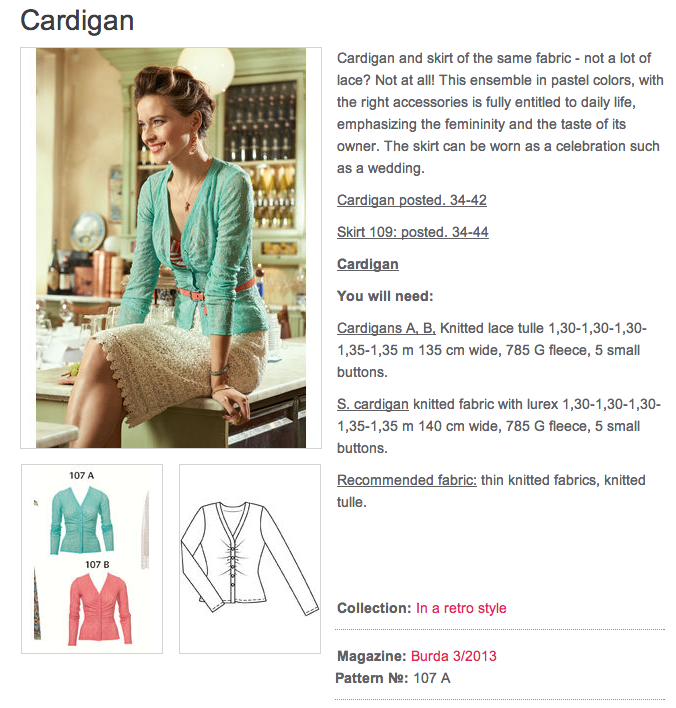 I'm actually working on a cardigan from the 04/2010 issue of burda. I hope mine turns out as nice as yours! I really love it! And this is what I have now on my sewing tabel! it is my second take. I love your snaps! , realy great ideea. Love it. Pretty style and color. This is so pretty. Your fabric and color choice, I love it! I've had this pattern on my short list and seeing how lovely it works here I MUST make it soon. Thanks for the informationI'. I now have the confidence to sew mine up this week! Very nice job.